Wind turbine rotor failures have been reported that resulted in substantial damage and cost for maintenance and recovery. 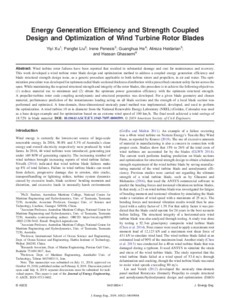 This work developed a wind turbine rotor blade design and optimization method to address a coupled energy generation efficiency and blade structural strength design issue, as a generic procedure applicable to both turbine rotors and propellers, in air and water. The optimization procedure was developed for optimum radial blade sectional thickness distribution with a prescribed constant safety factor across the span. While maintaining the required structural strength and integrity of the rotor blades, this procedure is to achieve the following objectives: (1) reduce material use to minimum and (2) obtain the optimum power generation efficiency with the optimum structural strength. A propeller-turbine rotor code coupling aerodynamic and structural properties was developed. For a given blade geometry and chosen material, performance prediction of the instantaneous loading acting on all blade sections and the strength of a local blade section was performed and optimized. A time-domain, three-dimensional unsteady panel method was implemented, developed, and used to perform the optimization. A wind turbine 10 m in diameter from the National Renewable Energy Laboratory (NREL) (Golden, Colorado) was used as a base design example and for optimization based on an extreme wind speed of 100 km/h. The final result achieved a total savings of 18.72% in blade material.